High Quality- It is made of environmentally friendly ABS resin material.Very strong and tenacious which is able to withstand temperatures resistance of -10°C to 90°C. It also non-toxic and odourless. 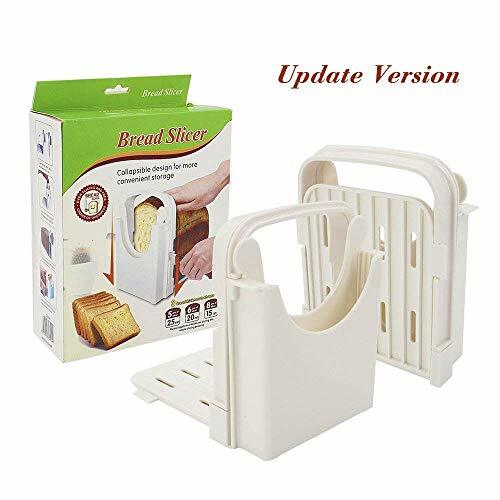 Very Functional- Designed to allow you to cut the bread into 5 different thickness of 10mm/15mm/20mm/25mm/30mm.Never worry about cutting your fingers,perfect for daily use. Simple Mechanism - Simply slide the divider into the device to choose your desired thickness of your toast or bread. Foldable Design- For easy-storage and space-saving. MultiIpurpose- Generous slicing surface accommodates bread,toast, bagel,loaf and sandwich. Can also be used to cut ham, cheese and vegetable.